This painting is SOLD, but I can recreate it. Your purchase may differ slightly from the image posted on the website. This lovely wool painting features two yellow birds resting contentedly on branches of lilac tree and enjoying a warm spring morning. The blue-yellow background creates a sensation of shining sun, and highlights the birds golden hued feathers. The wool fibers, which form the individual, tiny flowers on the lilac branches, have been placed so that their colors are not uniform. This allows you to see how the small flowers blossom in their own time, but come together for a lovely display of lavender and purple shades. This beautiful wool painting, with its combination of two yellow birds and lilacs, adds warmth and charm to any home, and will be an original and unique birthday present as well as a welcome or housewarming gift. The wool painting “Birds on branches of lilacs” is an original artwork. Painting size: 8 x 10 inches (20.3 x 25.4 cm). Brown frame – Overall size: 9 x 11 inches (22.9 x 27.9 cm). Antique bronze frame – Overall size: 10 ½ x 12 ½ inches (26.67 x 31.75 cm). Gold frame – Overall size: 11 x 13 inches (27.9 x 33 cm). I also offer different frames and can switch to the frame of your choice. You can also buy the wool painting as is, without frame and glass. To keep the painting safe during shipping, a plexiglass cover will be used to protect the fibers. You can then use the frame of your choice to display the image. To create my paintings, I use a unique technique called “Wool Painting”, also known as “Wool Watercolor”. All of my paintings are made from 100% Merino sheep’s wool by hand placing fine wool fibers layer by layer on the back of the picture frame, covered with glass and inserted into the frame. This process does not use any glue, needle, water, or paint. Wool paintings carry special warmth and energy as wool is a natural, living material that keeps the mood and warmth of artist’s hands. Wool paintings have useful properties: they relax, soothe, and calm as the viewer pleasantly examines them. A photo of a wool painting does not convey all that can be felt upon close and detailed examination. By owning such painting, you can ask your guests the mysterious question of what material is it made of. They will generally be indecisive on if it is painted in oil or with watercolor, but decidedly delighted when they learn it is natural sheep’s fiber. Wool painting is always a stylish decoration and original gift. It creates an atmosphere of magic and fills your home with comfort. It is possible to customize a similar painting to your liking. I can make this painting to any size, with different frames, and matting options. Your painting will be created in same style, just with the changes you requested. After you order, I will start to create your painting immediately and will finish it within 3-7 days. Before shipping I will send you an image of the painting for your acceptance. Please contact me if you have questions about my wool paintings or are interested in having something created especially for you. 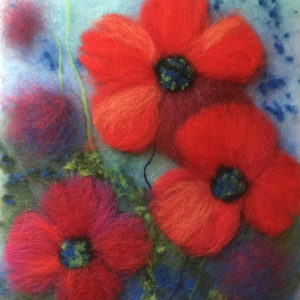 I would love to take your dream and fashion it into a wool painting for your enjoyment.